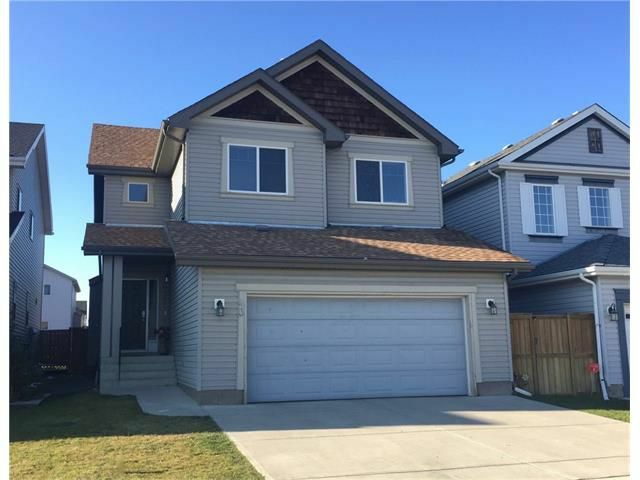 This home is perfectly designed for a busy family with a large mudroom/laundry entry area with lots of cabinetry. Open concept main floor offers a kitchen with SS appliances, island with eating bar, & large pantry, living room with centered fireplace, & dining room with access to the back deck. Upstairs is complete with brand new carpet, 3 decently sized bedrooms, bonus room, & 4 pc bathroom. Master features a walk in closet, soaker tub, & glass surround shower. Low maintenance landscaped yard has a spacious deck, fire pit area, & access to the back alley. The home is steps away from a pond, walking paths, community center, & brand new K-4 school.